If you live in Germany the first thing I recommend is buying a bahncard. Now, you can choose between 25%, 50% or 100% off, obviously, the higher the discount, the higher the price of the bahncard. You also have a choice of getting a bahncard for 3 or 12 months. It doesn't matter which card you get though, whenever you need to cancel, you MUST do so at least 6 weeks before the expiration date, in writing or else, they will renew it for the full length of 1 year. Probe bahncard100 - 1249 euros (I said the higher the discount, the higher the price of the bahncard, didn't I? But if you think about it... you have unlimited travel for 3 months and don't pay a penny extra, depending on how much you travel... it might pay off). Bahncard100 - 4090 euros - somehow they only give the price on the German site. You need to fill out a form to order this bahncard and by the sounds of it, it takes a while to get it. Children under 6 travel free, don't need a ticket or a mention on the reservation. Children between 6 and 18 only pay 10 euros for the Bahncard25 (Jugend bahncard) - they get a discount when traveling alone, but children under 15 travel for free when traveling with their parents. So I guess, you could say that why would they need a bahncard if they travel free? Well, the person at the train station couldn't give me an answer, but I'm guessing since they are very independent here, that they might travel to another village to go to school or travel with the school and in these situations they'd have to pay. That's no official answer... only my guess. To continue on the above topic, you cannot book an online-ticket (as it paperless ticket) for your child, if she/he is traveling alone, you must get it by post. There is a DB family pass for families with more than 3 children. Children between 6-14 who are traveling with their parents must be stated on the ticket. If booking online, you choose the number of children, but you are not charged for it. Believe me, it's true, I just did it. DO NOT order this bahncard online. I tried and I'd have to send her birth certificate, plus I don't know what else, just go to the train station and ask them, no need to show any documents other than your passport. There are families compartments in the trains if you have little ones, this could be a nice choice. I remember traveling from London to Edinburgh when Victoria was about 2 and she managed to talk to all of the passengers, even the ones sleeping! It was really embarrassing, but hilarious at the same time. There is an app with games (in German) for kids. Also, at the train restaurant they offer kid's meals for purchase. Small dogs travel free of charge if it's in a carrier (definition as their website: size of a domestic cat or smaller). Larger dogs pay half-price. You would select a ticket for a child over 6 traveling alone and the ticket would come in the post. If you have a cabin on an overnight train, you can bring your dog for a 30 euros charge. There are discounts for people over 60. You can also purchase a service and they will pick up and deliver your luggage to your destination. More info on this page. Side note: Does anybody here think of New Kids on the Block whenever they write or say step by step? No? oh, ok then... never mind. So, I've just finished my 1st purchase online and now you will see it page by page, all that I had to do. I had already registered, but it's super easy. Click on log in and you will see "register for the 1st time", then fill out the form and voila! You get an email with your cust. number. Note that I added my daughter's age range and chose the correct bahncard option. 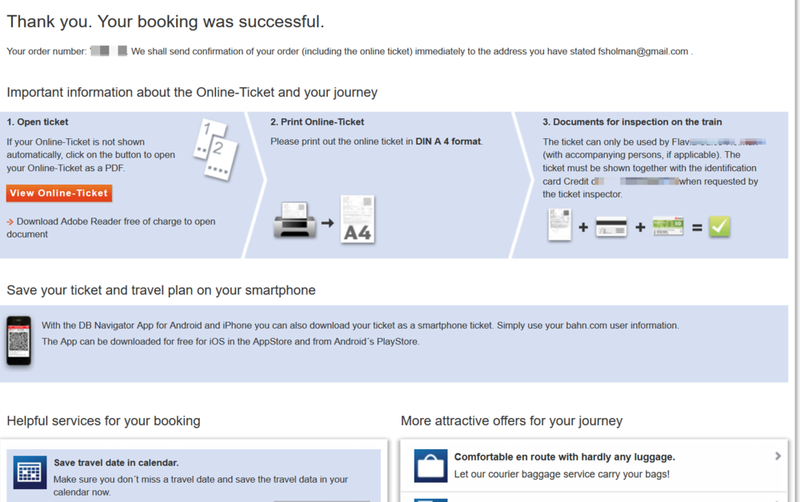 You select the best times for your trip, on the previous page it will actually show only the 1 way price and then you click on "return journey" to come to this screen below. Once you've decided on the times that suit you, click on purchase. Another confirmation page will appear, so you can choose 1st or 2nd class and the different price tiers, select by clicking on "continue". Select how you want your ticket delivered. If you choose by email or via the app, you will have to enter the bahncard or credit card details and have all of that at the train when they check your tickets. 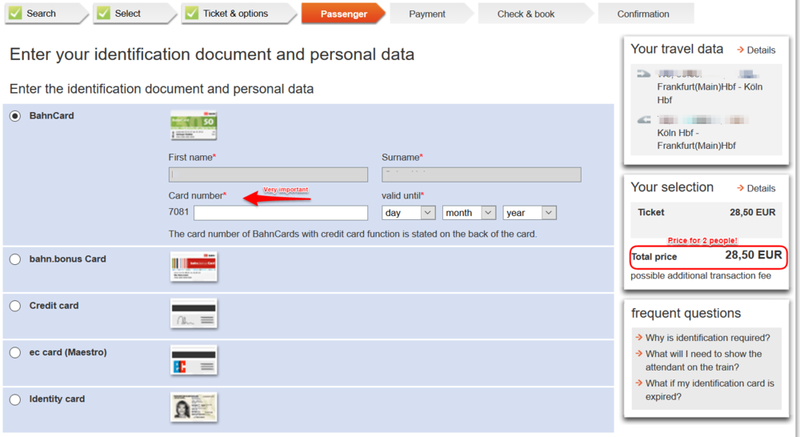 Side note on that: I tried many times entering the bahncard number on my paper temporary bahncard and it didn't accept. When I called the number the guy told me that it's because my bahncard hadn't been processed yet. Mind you, I bought the bahncard on the station, the person said that it was available immediately, but they send a request by mail for the actual card, so until it's in their system, it won't accept. In the end I chose to verify via cc and it worked. At some point you get a little note that says, yay, the ticket you are booking includes 2hrs of free public transport on the other end so you can go to your final destination for free! Plus they try to sell some other stuff. Enter the passanger name and bahncard or credit card number. At some point you will also have to accept the terms and you get a chance to update personal data, travel dates, etc. Once again you can check everything and finally book it. Celebrate, you've booked your tickets online! Obviously with this quick guide there were no sweat and tears, but it could have been much worse, ha, ha, ha. Enjoy your trip! I'm looking forward to mine.